The MAX9505 Filters and amplifies standard-definition Video signals. Maxim's DirectDrive" technology eliminates large output-coupling capacitors and sets the Video black level to ground. An internal reconstruction Filter smoothes the steps and reduces the spikes on the Video signal from the Video digital-to-analog converter (DAC). The input of the MAX9505 CAN be directly connected to the output of a DAC The MAX9505 provides a compact, integrated, and low-power solution. The reconstruction Filter typically has 3dB attenuation at 9MHz and 50dB attenuation at 27MHz, and 1dB passband flatness to 5.5MHz. 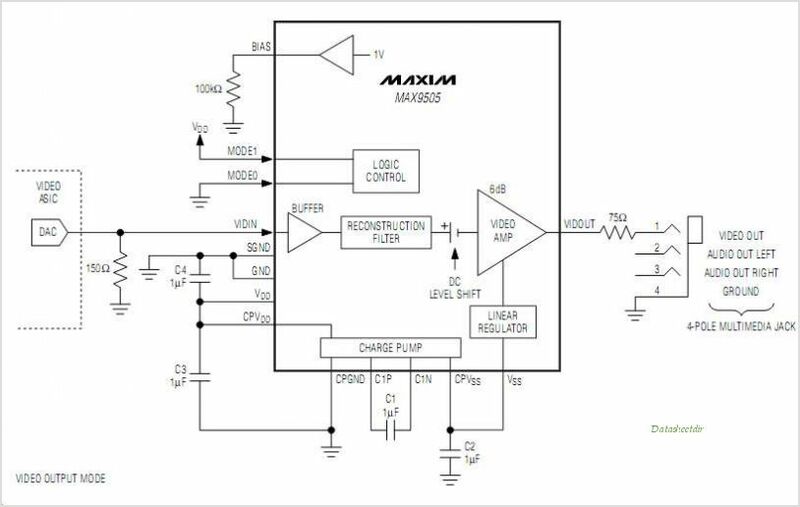 Maxim's DirectDrive uses an integrated Charge Pump and a linear Regulator to create a negative power supply to drive the sync below ground. The Charge Pump injects so little noise into the Video output that the picture is visibly flawless. The MAX9505 features an internal 1.7 Analog Switch that Interfaces with a 4-pole Multimedia jack. This Switch allows one of the poles to be set as a Video input, a Video output, or a Microphone input. The MAX9505 is offered in space-saving 16-pin QSOP and 16-pin TQFN packages and is specified over the -40C to +85C extended temperature range. This is one package pinout of MAX9505,If you need more pinouts please download MAX9505's pdf datasheet. 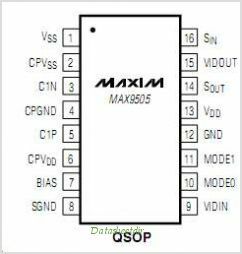 This is one application circuit of MAX9505,If you need more circuits,please download MAX9505's pdf datasheet.